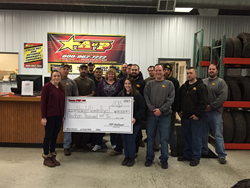 A&P Auto Parts, a distributor of recycled auto parts, joined efforts with the Northeast division of Team PRP to raise $19,000 for the Wounded Warrior Project. We at A&P and our employees are honored to give to such a great cause. A&P Auto Parts, a distributor of recycled auto parts, joined efforts with the Northeast division of Team PRP to raise $19,000 for the Wounded Warrior Project. The Wounded Warrior Projects serves veterans and service members who incurred a physical or mental injury, illness or wound, co-incident to their military service on or after September 11, 2001. "We at A&P and our employees are honored to give to such a great cause," said Billy Abold Jr., the owner of A&P Auto Parts. A&P Auto Parts, established in 1969, is a first class used car parts dealer and automotive dismantler with two locations in Syracuse and Rochester, New York. This is where our dismantling uses environmentally friendly practices to recycle cars and pays used vehicle owners cash for making responsible decisions. New York is also where our sales and shipping team work to deliver used and new auto parts to car owners, retailers and companies nationwide. Please call A&P Auto Parts for more information about the Wounded Warrior Project donation (800) 962-7222.